Andrea: Captain Orlando Murillo has been with Pisces for two years, covering for other Captains on several boats. He is thoroughly trained and has been licensed for 15 years. He speaks English well, is easy to get along with and is an excellent fisherman. Deckhand Beto Lira is also aboard. Adriana: Captain Ricardo Agundez comes from a family of fishermen and has fished with Pisces since his late teens, having a total of 11 years with Pisces. Ricardo is one of our best fishermen and many of our clients will fish with no one but him. Ricardo speaks some English. Deckhand Beto is new to the fleet; he speaks a little English as well, and is pleasant and eager. 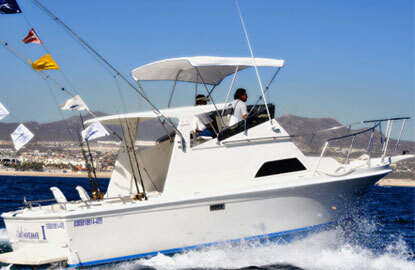 Captain Ricardo landed the biggest tuna ever for the Pisces fleet in 1999, which weighted 310 lbs. Ricardo�s biggest fish ever was an 850 lb black marlin caught in 1990.